The tank from Jo Jo Tanks WA will water the school’s Stephanie Alexander Kitchen Garden, which features vegetables and herbs, native and bush tucker gardens and an aquaponics system. Two Rocks principal Elizabeth Wildish said the facility would contribute to the students’ knowledge of water conservation. 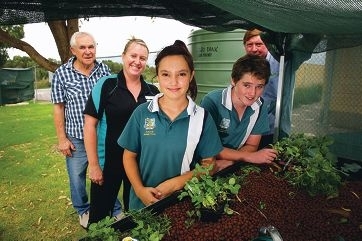 Aquaponics devotee Colin Vann, who was instrumental in setting up the school’s aquaponics program through funding from developer Yanchep Beach Joint Venture, approached the Wangara company after talks with Two Rocks’ garden co-ordinator Kerry Brown. Jo Jo Tanks manager Glen Gibbons said it had been a pleasure to help the Waterwise school.